We did some work on the condo this weekend!! Here is a little sneak peek! Yeah. I know not very much:) Let me tell you what a difference a coat of paint can make! It seriously transformed the living room and dining area. I picked out a light grey and a darker grey for an accent wall. It looks pretty awesome. My fabric arrived today too! 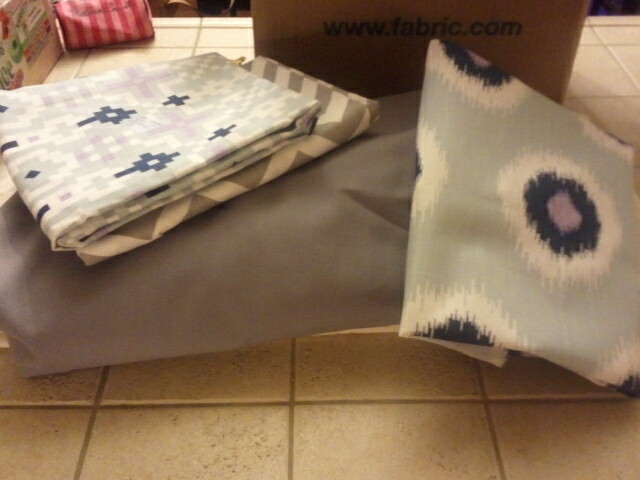 I plan on making some curtains and throw pillows for the living room. In addition to making curtains and painting walls we are also having a moving sale on Saturday. So I’ve been going through the entire house getting rid of everything I haven’t used. I’ll be kind of excited when things slow down a bit. Today, I am guest posting over at one of my favorite blogs Violet Imperfection. I’m showing off how to make some cute headbands!